HighBridge Audio, 2010. 7 ½ hours on 6 CDs. I put this audiobook on hold after my sister Becky told me that her daughter’s college graduation had the best graduation speaker she’d ever heard – he even got a standing ovation. That was enough of a recommendation for me. I was not at all disappointed when I started listening. I got the audiobook because while I'm on the Newbery committee, that’s the best way for me to get books read that are written for adults. And with all the Spanish words used in this book, it was nice to hear the author read it. He doesn’t use a lot of variety in voices, but that’s okay – it works with this book. But I ended up checking out the print version in order to pull out quotes for Sonderquotes – I kept getting blown away by his words and I wanted to remember them. 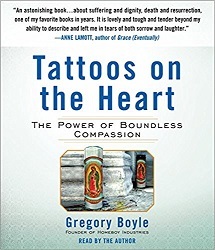 Father Gregory Boyle, a Jesuit priest, is the founder of Homeboy Industries, an organization that gives jobs to gang members and helps them get out of gangs and removes their tattoos. He lives in downtown Los Angeles, and has since the 1980s (when I lived in downtown Los Angeles for a few years) – and knows and loves gang members. He learns their names and knows them as people – and that makes a powerful difference. The book is mostly stories, and they touch your heart. Something about seeing, through Father Boyle, that God sees and cares about gang members – helps me understand with my heart that God sees and cares about me. And not only does God care about me, He delights in me. Gregory Boyle shows that it’s possible to not only tolerate kids who are gang members – but even to see that they are delightful. Wow. In finding a home for these stories in this modest effort, I hope, likewise, to tattoo those mentioned here on our collective heart. Though this book does not concern itself with solving the gang problem, it does aspire to broaden the parameters of our kinship. It hopes not only to put a human face on the gang member, but to recognize our own wounds in the broken lives and daunting struggles of the men and women in these parables. Our common human hospitality longs to find room for those who are left out. It’s just who we are if allowed to foster something different, something more greatly resembling what God had in mind. Perhaps, together, we can teach each other how to bear the beams of love, persons becoming persons, right before our eyes. Returned to ourselves. The beauty of this book is watching Father Boyle treat gang members as delightful human beings. It’s obviously not easy, and comes with a lot of pain. At the time of writing the book, he had buried more than 170 people he cared about because of gang violence. Many of the stories he tells end with the tragic too-soon death of the subject of the story. And the things he pulls out touch your heart. He talks about the “no matter whatness” of God’s love and God knowing us by name. You’ll see lives changed because someone showed compassion on an outcast – and maybe that will change your life, too. Look for more quotes on Sonderquotes. I highly recommend this book.